In one of those useful coincidences of the New York art scene, two current exhibitions discuss global commerce and history, labor and money through one peculiar entry point: sugar. At David Zwirner, Oscar Murillo has installed a candy factory with free chocolate-covered marshmallow takeaways for the visitor. 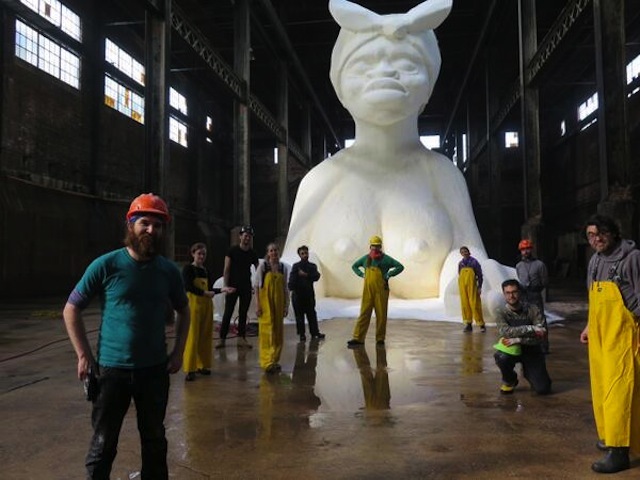 In the defunct Domino Sugar Factory, Creative Time has commissioned Kara Walker to create a massive sugar sculpture of a mammy-as-sphinx. Like art, sweets are meant to please, to be sampled and consumed; we speak of “refinement” and “taste.” For much of modern history, sugar was a luxury good for the rich. Like art, it is a multibillion dollar industry today. 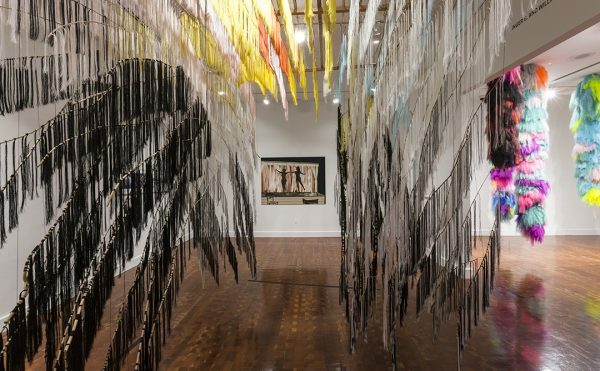 Now, two artists of color, both of diasporic backgrounds heavily shaped by the production and circulation of this commodity, are claiming it in their work. 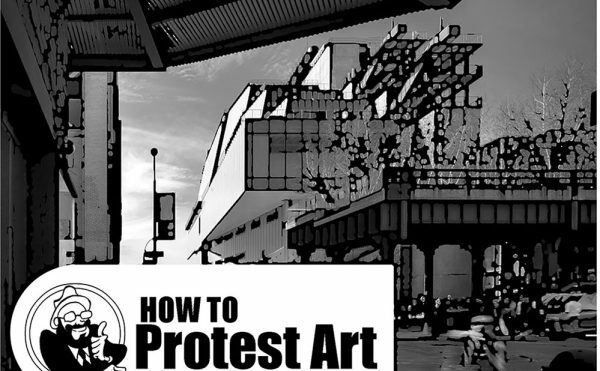 The installations have each provoked rage and praise but, ironically, little discussion of their own production. Let’s take the comparison to sugar a step further: what happens when we shear these works’ sugar coatings — the glossy sheen of art — and look at them as their own systems of commodity and labor? How were the pieces produced, and how does that production reflect the histories they discuss? 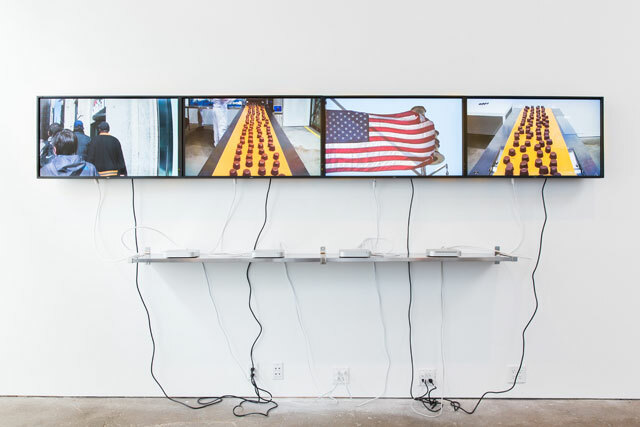 Though both installations are about labor made invisible by the forces of history, race, and globalization, both are credited under a single author; the actual labor that produced them is once again rendered invisible. In Murillo’s, which is titled A Mercantile Novel, factory workers have been brought from Colombia to produce the chocolates at Zwirner, but a ceiling-high stack of crates literally hides them. 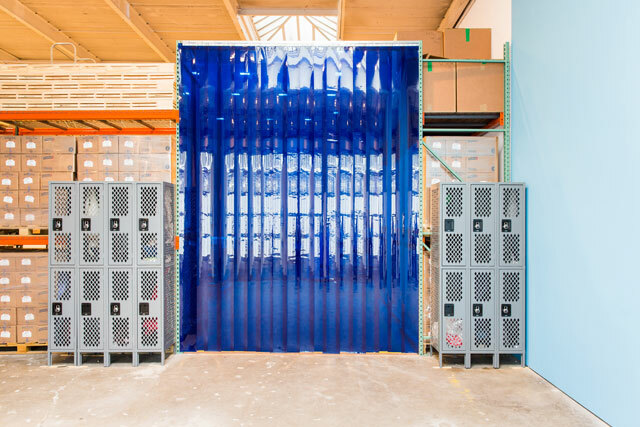 To see the workers, the visitor must either rely on live camera feeds (also broadcast online) or wait to catch a glimpse of them before they disappear behind a large plastic curtain. The installation becomes a sort of “Chinese room” of labor: we understand that work creates the candies that we take away, but we don’t see the actual process or interact with the makers. 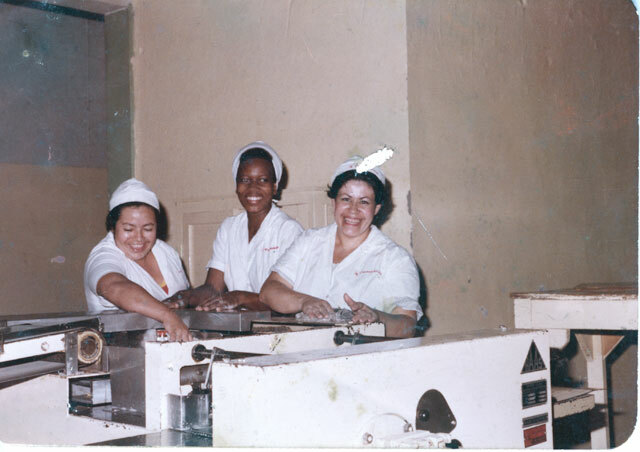 It’s worth noting that Murillo’s mother worked at Colombina, the candy factory from which these laborers are now visiting, and his father worked in a sugar cane factory. The installation, then, is a sort of autobiography, but a tense, uncomfortable one. 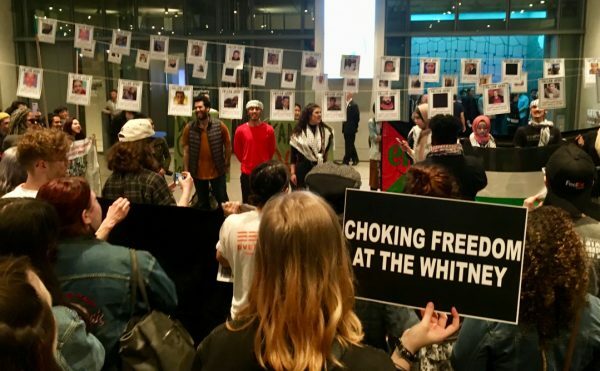 It’s unclear what the audience is supposed to learn or imagine about his parents’ lives, or the many lives of sugar workers, when those workers are hidden. Just like candy in the supermarket, Murillo’s chocolates are alienated from their production, offered as tokens to savor and ponder without any kind of serious engagement with either those who made them or the immense apparatus that paid for all this. What resources brought this team of laborers from Colombia to work full 9am–6pm days for two months, restocking the gallery’s shelves with packages stamped with glib smiley faces? Gallery visitors and volunteers are invited to take candy and share it throughout the city’s five boroughs, whether on foot, by bike [link to Citibike theirs], by taxi, by subway, by bus, etc., reflecting all modes of typical transportation throughout New York City and the diversity of its communities. If I’m reading this correctly, motion reflects diversity (and, if we are generous, the mobility of these chocolate workers reflects the diversity of the world). One can only hope this was crafted by the gallery’s PR department without Murillo’s full approval. Playing on this theme of labor, Creative Time posted a time-lapse video of the construction of the installation. We see a team of laborers — mostly white men — doing the work of sanding and sculpting the giant sphinx, pouring pounds of sugar over it. The video and supporting materials on the website allow us to visualize the process, to learn a little about the many artisans who refined the piece. Still, Walker’s installation plays heavily into the trope of artist-as-brand — only in this case with more meaning, as she’s enacted a striking reversal of historical erasure: her team of white laborers flies under the radar, while she, the black female artist, is on the marquee. The installation also includes a group of blackamoors, adult-sized figures with oversized heads that carry offerings to the gigantic sugar-coated sphinx. Unlike the latter’s refined white sugar, the blackamoors are made of sticky, dark molasses. The blackamoors become a stand-in for the process of refining and producing sugar — the grotesque and unwanted laborers of sweetness. They come to stand in, too, for the work of producing art itself: the many unglamorous and uncredited technicians and studio assistants outshone by their creations. Unlike Murillo’s failure to create a meaningful connection between labor and product, the strength of Walker’s piece is that it doesn’t offer us anything. Though this work and her others are stocked with racially and sexually charged images, no pronouncement or moralization is offered. Viewers bring their own (dis)comfort with and knowledge of American history to the art, but it’s not the art’s duty to be generous. Both Murillo’s and Walker’s projects speak to labor and commerce, but both, by nature of their grand scale, are very much part of the structures they critique. While it’s possible that no major artwork can escape these structures today, we, the visitors, are obliged to look beyond shining surfaces, which can distract from still urgent topics. Consider, for example, the fact that the human cost of our sweet teeth is ongoing, not a relic of the 19th century: a few weeks ago, the New York Times reported on a disease that has killed thousands of sugar mill laborers in Chichigalpa, Nicaragua. 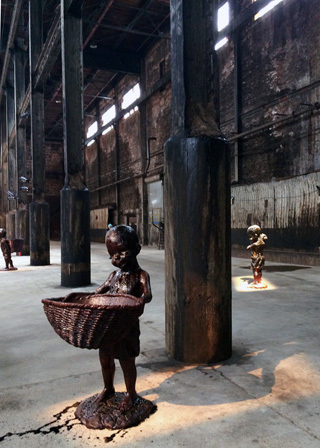 The problems are closer to home, as well: Walker’s piece has been criticized as a real estate stunt in a historic factory that was known for major labor disputes. Her sphinx is made up of tons of sugar donated by Domino, making the brand and commerce whose history she’s exposing literally a part of the work. Murillo’s quick rise to blue-chip status, which led to Zwirner giving him a budget of this scale, is endemic of the boom-bust cycle of art speculation, mirroring the insanity of today’s investment-banking-driven capitalism. And, as critics have pointed out, the big gallery and corporate support behind A Mercantile Novel rob it of any power to critique the system of chocolate production. Let’s use these works to unearth troubled histories, sure. But let’s unearth the stories behind the works themselves to look at our troubled present.